Forget about romance and Prince Charmings — these Disney princesses are ready for real action. Brace yourselves, "Frozen" fans! The day you've been waiting a long, long — seriously long — time for is here. The first trailer for the sequel to the blockbuster animated feature is out. And we've got good news: It was worth the wait. The two-minute "Frozen 2" tease from Walt Disney Animation Studios reveals that dark times have befallen Arendelle once again, and the royal women of the land — along with their trusty pals — are ready to fight back against mysterious forces. The clip opens with Queen Elsa standing before a stormy shore and wearing the same look of determination viewers saw as she erected her ice palace in the first film. Suddenly, she runs right into the surf, freezing the surface with every step until a wave overpowers her. Undaunted, she unleashes frosty fury on the tide and tries again. Back home at the castle, Princess Anna sees the darkness illuminated by strange, snowflake-like patterns of blue light. Elsewhere, an intensely serious Kristoff races through the woods on the back of his devoted reindeer, Sven, as a team of other reindeer follows. What's it all about? What are they racing toward or running away from? That will likely remain a mystery until the movie hits theaters this fall, but the trailer reveals that, whatever it is, the characters at the heart of the story — including snowman Olaf — will eventually face it together. And one of them in particular seems poised to save the day. 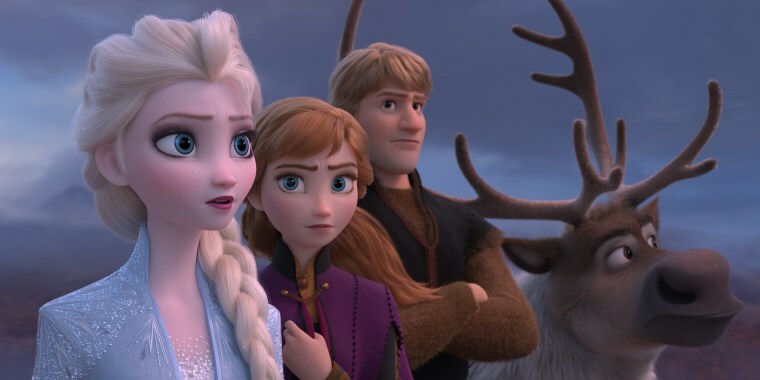 In the trailer's final scene, Elsa, Anna and Kristoff can be seen roaming through a forest together, when the princess pauses and seems to sense danger. Anna then brings the dramatic clip to a close by grabbing Kristoff's blade and slashing into an unseen menace. See more when "Frozen 2" opens nationwide on Nov. 22.